W.E. Anderson Hi-Flow™ control valves are single seated, top or cage guided globe valves - probably the simplest, from construction standpoint, yet most versatile control valve in The Hi-Flow™ control valve can fit applications with a smaller size since the valve has a greater flow capacity than most conventional valves of the same size. Coupled with the high flow capacity, the Hi-Flow™ control valve maintains a wide rangeability of 50:1 to insure precise control. Heavy duty Hi-Flow™ control valves are ruggedly constructed of the highest quality materials, precision machined, and performance tested to assure years of trouble free service. Standard packing consists of PTFE V-rings and wiper to minimize friction without leakage at high operating pressures. Available in brass, iron, 316 SS body, trim is 316 SS with all welded plug construction provide superior durability and corrosion resistance. Caution: Use of an actuator supply gas other than air can create a hazardous environment because a small amount of gas continuously vents to atmosphere. 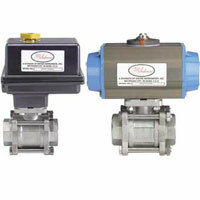 Flow control, mixing, or diverting service. 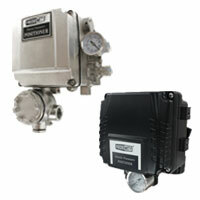 Perfect for steam, water or compatible glycol solutions. Compatible liquids, gases, and steam. 1/2" to 2" female NPT. Iron or Bronze Body - 250 psi (17.2 bar), 316 SS Body - 300 psi (20.7 bar). Body: iron, bronze, or 316 SS; Trim: 316 SS; Packing: PTFE. 20 to 400°F (-7 to 204.4°C). 3 to 15 psi (0.21 to 1.0 bar) standard. Custom ranges available. 220, 222, and 230: 100 psi (6.89 bar). 221, 223, 231, and 233: 50 psi (3.45 bar). EXAMPLE 2001 V N 3 2 230 2 165EL Series 2001VN32-230-2-165EL, 2-way, Push-to-Close Valve, 3/4" NPT, single seat, 1/8" needle valve plug, bronze body, 316 SS trim, Lin-E-Aire®, air-to-raise actuator, with electric linear positioner.